Q.7.- I have always thought that chess-playing engines do cheat. One may accept it or not, but they not only cheat, I suppose that to be able to play Chess, they have to cheat: when you play against one of them (OTB games) , you cannot use written notes, books, magazines etc. But they do use the opening book they have. This prevents them from forgetting opening lines, changing the order of moves, etc. And the same is valid for the analysis they carry out later in the game. As a human, you may end up mixing lines, playing wrong moves in advance, overlooking some move when having to play. They will never make such mistakes. Engines do not overlook moves once they have decided on a certain line of play. And they do not change moves by mistake. So, if you want to beat them ,you will have to be more cunning than them ,but do not put your hopes in human-like type of mistakes. Then the question is still there: Can they be beaten? How?. Well, I do not have a straightforward answer. I do not think there is such an answer. 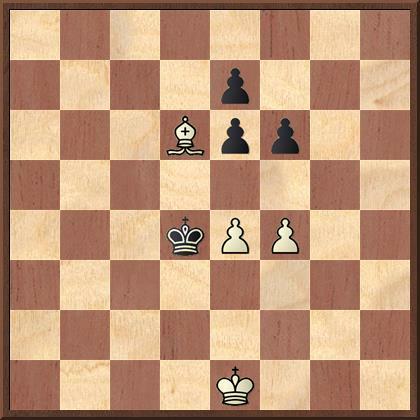 I suppose you should survive in the opening by achieving a balanced position, play positionally active during the middlegame without entering no-way-out alleys, choose the right balance of forces, assess the matter of the Bishop pair or the B vs. N as accurately as possible and try to keep the middlegame as closed as possible BUT as full of possibilities as possible. Today’s programs can play positional Chess with a high degree of proficiency. A different matter is when the game reaches positions with less and less tactics and more and more strategy. If the engine plays to win, it may give you some fresh targets to shoot at. If not, at least you will have the draw at hand… Playing against them as if they were humans, will not pay off. Forget about passive opening set-ups even if they lead to closed or semi-closed positions. With the initiative, you will be smashed. Forget about open positions or tactical melées with interchange of blows by taking pieces on each turn while it also takes yours: if it goes into such lines, it is because it has seen all the possible intermediate moves. The normal outcome would be ending up with one or several pieces down…So, the best policy for you would be to keep the piece balance as tight as possible . On the other hand, one may think that keeping it simple will be useful. Forget about it too. The main problem is to understand how they are able to “see”” all the drawbacks every move contains. And this is not easy to explain. Well, you may be wonder why writing about this topic since everybody knows they are (nearly) unbeatable. Perhaps because the whole thing is our last frontier today and perhaps because it can help us understand the way we think too. Be that as it may, it has not deterred me from keeping on playing Chess. So, do not think about engines, plies and other time consuming , mind-boggling concepts and … play the Eternal Game. The rest may only be an odd mental state. Reinmann. Mate in 3 moves. 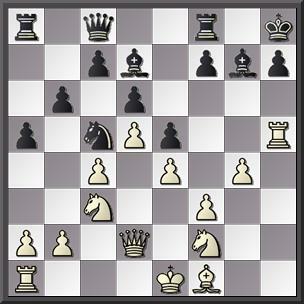 1.Why are today´s programs so strong /much stronger than top chessplayers?. 2.-In which ways “they” play different to us? Conversely: in which way do we play different to “them”? 3.-What do “they” see we do not see? 4.-In what way do “they” see/assess the elements of a game that we are unable to match them? 5.-In what way do “they” apply the elements of Chess that we fail to match their prowess? 6.- Can we really make any attempt at beating them? 7.- And the Big One: Do “they” cheat?? Q.1/ Q.2 – They play much stronger due to a variety of factors: they never forget the openings and play them without mistakes. They are extremely strong at tactical calculation. They never speculate or feel fear. They have no interest in their opponents’ ideas, emotions, body language, noise, etc. They are not pressed by rating points, timetables, previous results, statistics, final standings, money they can earn or lose, they are never tired or bored, they are never hungry or sleepy, they never have “a bad day” and have no prejudices, there are no ugly moves/positions for them. They are only there TO PLAY CHESS AND ONLY CHESS. During the past few years,apart from refining the tactical side of the program as far as calculation of movements is concerned, programmers have learnt to include strategical ideas in their way of choosing a move, making them even more deadly: for instance the always complex matters of B vs. N , the change B for N, the different value of B’s and N’s according to the position -and more if the position is tactical, etc. Mate in 3 moves. G. Ernst. Happy New Year 2016 to all my readers. 2015 has been very bad for me but let me tell you I wish all your dreams come true this next year. Thank you very much for being there. Then you go to play your own games and everything seems “rough”, full of ups and downs, with oversights on both parts if not gross mistakes. Back at home you tend to think you have been tricked by those GMs: the theory they played differs from the theory you wanted to imitate at one junction and you lost the thread of the game, and…and…and… etc. Well, one of the many problems in Chess occurs when you have left the book and instead of a lovely attacking position with clear objectives and so on you face one of those level positions with several options but no clear plans, no threats, no weaknesses to attack, and so on. You have to play one move and after going to and fro considering one move after another without any clear idea, then you move a piece. But after seven or eight moves you realise you have committed your position to a degree that even a draw would be a miracle. But GMs have learnt (after all they are full-fledged professionals and they excel at what they do) that there is no such a thing like “pretty” or “ugly” squares/moves, but good and bad moves, good and bad plans , good and bad strategical/tactical decisions. Even Nimzowitsch was accused of playing “bizarre” moves, moves nobody understood, nobody would play because they went against the accepted truths or were labelled as “ugly”. Nevertheless, he made history, while many of his detractors, those defending “normal ideas”, those unable to accept that Chess was not a dead thing but a living, evolving one, passed unnoticed. 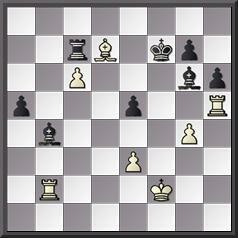 Here, Nimzowitsch played... 17…Nha8!/ and went on to win the game. Phase 1: No matter what you do: you start losing CC games. Phase 2: You need to rethink your approach to Chess and this means a change in your opening repertoire because for some reason, you have decided to torture yourself with CC. What can be recommended for OTB Chess is not valid for CC. That’s all. Then, what can be done , apart from nothing?. Sometimes I tend to thing that it would be better to forget everything about dynamic strategy and so on: that is for OTB, not for CC. Then?. Well one of my last ideas is to revert to the classics, concretely to players like Nimzowitsch and -why not?- Petrosian. But can it be done when we try to follow all the moves databases suggest so creating games of the type we all know today?. Or should we play bizarre openings/defences ? 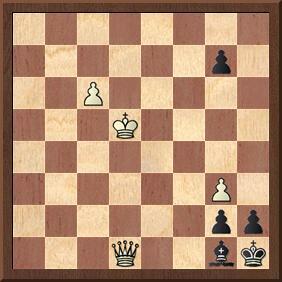 (If you do so, don’t use a program to check the positions…) The answer is that what we perhaps should do is not to play bizarre openings but some of the strategies suggested by Nimzowitsch: centralization, restraint and , above all, blockade. As how we can do it , well, the idea is still in its beginnings… I have been reassessing some games by Nimzowitsch and one of the ideas is that he was a superb strategist who based everything in a deep tactical insight. If you study the chapter devoted to blockade in his “Chess Praxis” you will see how he was able to carry out his strategical/positional ideas using tactical threats. 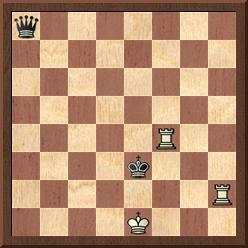 This position is from Nimzowitsch-Möller, Copenhagen 1923. How would you continue? When I go on holidays I like visiting bookshops and having a look at the Chessbook section. Yes, today you can get anything anywhere, and more through the web, but … This September I found a book the second edition of which appeared in 1889 published in London by G. Bell and Sons. The title is CHESS STUDIES AND END-GAMES and contains the studies and endgames composed by Josef Kling (1811-1876) and Bernhard Horwitz (1808-1885) . The original first edition was published by the authors in 1851 and the 1889 edition was a revised and corrected one by Revd. William Wayte. The book has two parts, one of them devoted to “Chess Studies” and the other being a “Miscellany of Endgames”. Many people think these type of books are useless: a lot of diagrams featuring composed positions to solve and nothing more. A quick glance at one or two of the positions , a possible (and most likely wrong) solution by seeing the apparent (and probably wrong) first move and a boring sneer. (It’s much better a book full of opening variations outdated since the very moment it goes to press, isn’t it???). Wrong approach. I must confess there was a time I had that stupid attitude… Later, I realised how valuable solving studies,problems and endgame compositions to train one’s tactical skills is … I think it was Botvinnik who pointed out that there was no strategy in studies. As in most of the topics he wrote about he was right. You cannot solve a study or a problem by using strategical ideas or looking for deep strategical plans. These things have to do with pure calculation. Alexander Kotov , the man whose books taught how Chess is played to several generations of players, said that any work on this field was beneficial and useful to the player. But this book provoked a curious feeling on me: These two authors lived in the 19th century. Obviously they had their own lives, fears, pains, happiness, hobbies ,etc. though they devoted their lives to Chess. Over a century has passed and we know of them because of their work in Chess… What do we really know about those who preceded us in say, the last years of the 19th century and the first two or three decades of the 20th century?. All of them are now dead (I am speaking of those who lived in those years not of those who were born then). We read about their Chess lives, study their games and perhaps try to know what the places where they played were like in those years… But the man himself?. Of course the private lives of some of them are relatively well-known . Other ones’ are not so . 1. e5, Kd5 /2. Kf2, Ke4 /3. Kg3, Kf5/ 4. Kf3, Kg6/ 5. Bxe7 winning. 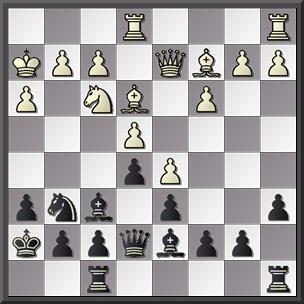 I have said on several occasions that one of my way of training is solving what I considered the most interesting Chess compositions, those of mate in three moves. 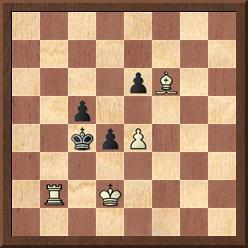 As you know, there are compositions featuring mate in 2 ,in 3, in 4, in 5, etc moves. Those labelled “mate in 2” are boring to me . And as far as I can remember I had never tried to work with mate in 4 problems. I found the above in the excellent book “Chess Tactics for Advanced Players”, by Averbakh, one of those books from the Soviet period that one of my friends in the former East Germany sent to me as a present many years ago. It is a real gem. Well, in one of the exercise sections the position appears. At first I was reluctant to work on it. A quick glance .But I could not take the position out of my mind.I love problems with few pieces, so I set up the board and after 45 minutes was able to solve it. As Kotov used to say, every effort you make analysing positions, endgames, problems… is valid to keep on progressing in Chess. 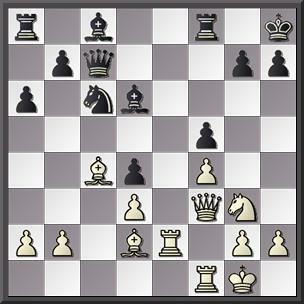 At the chessboard you must be imaginative, inventive, avoid playing by inertia after calculating only 2-move variations, etc. Of course in many positions the art of accurately calculating 2-move variations is fundamental (even Botvinnik wrote about this topic). But in the rest of cases something more deep, something more concrete and accurate is required. The time spent in training your tactical vision can never be lost. To some people , solving these problems may seem boring… Well, you are the chessplayer. Accept it and devise your own training programme. Chess has to do with openings, strategy,tactics,planning and endgames. Do it as you wish. The greatness of Chess is that … you cannot blame any other people of your results !. Spassky mentioned “PERSEVERANCE” as his main asset. So, at least, the rest of us, poor mortals, should avoid “indolence”. Shouldn’t we?. Perhaps you would like to try to solve this problem . It is a mate in 4. Professional chessplayers play for money. O.K. And the rest of us (millions throughout the world?) . Perhaps we all know why we play Chess …until we have to try to explain it… Maybe most people do not care about this matter. They play Chess and that`s all. But what is clear is what we want when we play Chess: all of us want to WIN. It is a sort of self-imposed challenge. Nobody plays Chess to become a better person, get more knowledge about the universe, etc. And we don’t play Chess “to learn” (or the worst version of this: when you lose and you think/somebody tells you: “you only learn from your defeats”. I have read/heard this scores of times . And I beg your pardon, but to me it is the most stupid explanation ever invented to justify defeats. – No, if this were true, simply lose all your games but be the wisest man on earth… We do not play Chess to learn. We play Chess, paraphrasing Mallory when he was asked why he/people wanted to climb Mount Everest and replied “Because it is there”.Then we play Chess because it is there. And we play Chess, study Chess etc. to WIN. Every chessplayer must design his/her Chess career. S/he must choose the way they want to study, train and play. The books they want to read, the games they want to study , if they are going to play OTB or CC and act accordingly. With a blog like this my only aim is to try to act as a mind/brain trigger making the reader constantly change his/her position to get fresh new perspectives/ideas. This is why I include games and problems. I cannot teach anybody to play Chess.Simply I don’t know why. And to me, the sum of its part is greater than the whole itself. Like most of you, I’m also trapped. If the moment arrives and after due calculation, would you give your Queen for two Rooks?. Well, I know it will depend on the position and a clear calculation. Bobby Fischer left us several examples of the fight R+R vs. Q. In my CC games I have had to decide in some moments too. Well, unless the position with the Q were clearly advantageous, I would choose the two Rooks (the last game I have lost was one in which I gave my Rooks for his Queen simply to realize that was the losing decision. Why did I do it?????? .-Because I made a mistake…. And this mistake is doubly painful BECAUSE I KNEW THAT THE REST OF THINGS BEING EQUAL, TWO PIECES ALWAYS WIN AGAINST ONE PIECE. Shame on me… I deserved it.